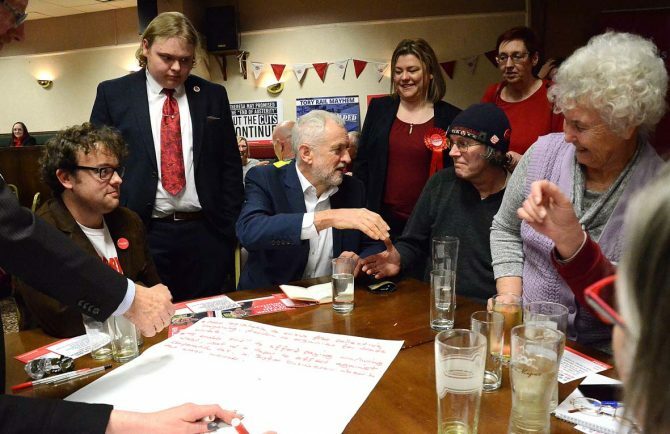 LABOUR leader Jeremy Corbyn sat down with party faithful yesterday and listened to their fears over minimum wage and low pay. Unlike one of his rockstar rallies, Mr Corbyn and his team decided to take a grassroots approach on his second visit to the town in six months. Locals at South Redditch Sports and Social Club, who were sitting in groups of four or more, were asked to write down the changes in national policy they would like to see. Mr Corbyn then went around the room to listen to people’s ideas before heading to the stage to give his own thoughts on the subject. “Low pay in this town and the rest of the country is a real problem and it’s an issue we need to talk about” said Mr Corbyn. “If there was a general election tomorrow Labour’s proposal would be to raise the minimum wage to £10 per hour – an absolute minimum. “We need to get rid of 0-hour contracts, scrap it completely, because they are destroying this great country. Mr Corbyn declared his party would also deliver radical changes to Universal Credit if it won power. He told the Standard Labour would end the five week wait to go on Universal Credit and scrap capability for work tests and replace them with a medical assessment. On Brexit he told party members, both leavers and remainers, they were living in poverty because of Conservative policies. Parliamentary candidate for Redditch, Rebecca Jenkins, who really made her presence known after giving a rousing speech at the club, said: “Jeremy’s here because Redditch is a key marginal seat. Ms Jenkins also revealed her regret on not making it to Mr Corbyn’s rally at the bandstand in late September. “I was over-the-moon Jeremy came to Redditch in September and that it was a well attended event but unfortunately I was injured at the time. The event closed with Mr Corbyn telling his supporters to back Miss Jenkins in the upcoming elections because Redditch is a seat Labour needs. Oakenshaw resident John Clark, aged 76, said: “I was really pleased with Jeremy’s visit and to get to know Rebecca better. Earlier in the day our Worcester correspondent Rob George caught up with Corbyn as he swept into the city.